This article is for application developers, which use EurekaLog exception tracer tool. If you are not a developer of the application - please, contact developers of application and let them know about this issue. Sometimes your application may show "EurekaLog crash report", also known as "Internal Error bug report". This article explains such reports. Internal error is (fatal) exception raised during capturing information about another exception (non-fatal). This exception is unexpected and it indicates wrong state of your application. When such exception is encountered - EurekaLog stops application and shows internal error report. It's not possible to continue normal work after encountering fatal exception. Internal error report is generated to avoid application's hang or crash (indeed: exception -> capture information about exception -> get another exception -> capture information about exception -> get yet another exception -> etc. until hang or crash). It's not possible to perform normal exception processing (collect call stack, save bug report file, send bug report to developers) for the same reasons. 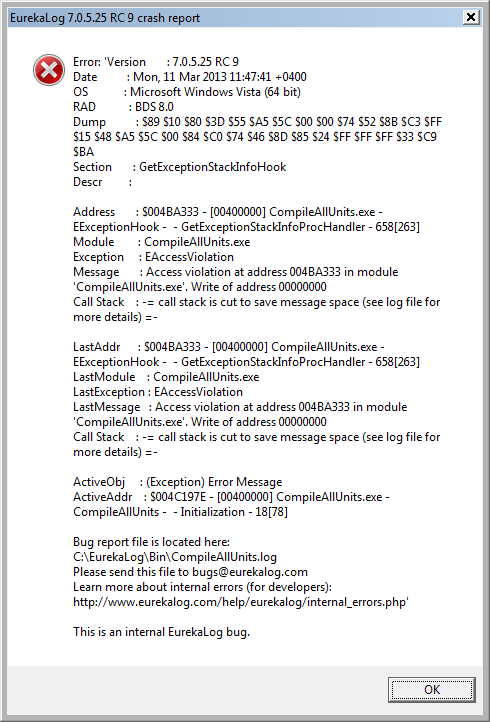 Middle part of internal error report (LastXYZ) shows value of ExceptionManager.LastThreadException. Usually this part doesn't hold any additional valuable information. Unfortunately, it's not possible to create proper call stack for internal error report: because collecting call stack means calling the crashed code again (so it's highly likely that it will cause another crash). That's why call stack show only location, which has detected the problem (up to GetExceptionStackInfoHook in the above example), not the location which has actually encountered a problem (there is no info in call stack about routines called from GetExceptionStackInfoHook). Internal errors can be caused either by bugs in EurekaLog's code or by bugs in your code. Usually, fatal exception is access violation exception occurred when EurekaLog collects information about ordinal exception. • Allowing application to continue to work after it encounters its first unhandled exception. Unknown exception (especially access violation) puts your application into unknown state. This state may be unstable, so any further work may cause crashes. For example, you may get access violation exception due to memory corruption bug in your code. And you continue to run your application after handling this exception. However, memory state is still corrupted. Thus, when next exception occurs, and EurekaLog tries to work with it - EurekaLog may trigger access violation exception due to corrupted memory. • Bugs in EurekaLog code. • Bugs in your code. When EurekaLog encounters unexpected exception during processing of another exception - it puts itself into so-called "panic mode". This is "safe-fallback" mode designed to continue work to complete creation of internal error report. • Installs memory manager replacement. This is done to allow allocating and disposing memory blocks when internal error was caused by corrupted memory manager state. Panic mode is used for all fatal exceptions, not just for internal errors. For example, when EurekaLog discovers corruption of memory block with its debugging memory manager - it puts itself into panic mode to allow to continue work despite memory corruption. Unfortunately, it's not possible to get exact reason for internal error from internal error report. That's because internal error report is created when fatal exception is discovered, not when it occurs. So, report doesn't contain information about exact location of the problem, only indication to generic code's section. Internal error report allows you to know that something is wrong in your application, but you need to do additional work to figure out reason. If you have reproducible test case to invoke internal error - please, contact EurekaLog support to get assist with resolving your issue. • Try to use internal debug mode. • EBase._InternalError - allows you to install your own internal error handler. You can use this to show another message, to create another bug report, etc. You can also to reset this handler to nil. • EBase._AllowBypassInternalErrors - allows you to ignore internal errors. This option has no effect if _InternalError handler is assigned. • EExceptionHook._ForceEurekaLogForInternalErrors - allows you to use EurekaLog for internal errors. This possibly may collect more information about fatal exception, but also may cause application's crash without creating internal error report.